What would MIT do without the Athena computing system? In 1983, few at the Institute would miss it. However, from its modest beginnings as a five-year pilot research project into the use of computers in the MIT curriculum, Project Athena has grown into an integral part of MIT student life and education. According to documentation provided by Information Systems, “96 percent of MIT undergraduates and 94 percent of MIT graduate students [have] Athena accounts. On a typical day, over 6,000 different users access their personal files and various software packages on the system.” Although Athena is heavily used by the student population, many students do not know the history of Project Athena and the significant changes it has brought to the networking computing industry. Project Athena arose from the need to integrate computational technology into the curriculum. 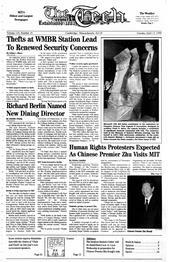 In May 1983, a five-year research program was started to explore the uses of computers in the MIT curriculum. IBM and Digital Equipment Corporation made major contributions of money and equipment to support this research. The results came to be known as Project Athena. The focus of its first five years in existence was the development of the operating system and discipline-specific courseware. Project Athena was later granted a three-year extension in January 1988. During this period, researchers focused on stabilizing the computing system and making it more user-friendly. The operating system moved toward vendor operating software (the original system was based on Berkeley 4.3 UNIX). In addition, an effort to promote and publicize Project Athena’s use in education began. Project Athena ended in June 1991. The Athena system was taken over by Information Systems and incorporated with the present MIT academic computing infrastructure. I/S then planned to extend the system into the research and administrative parts of the Institute. The Athena system is not simply a single computer system, but a network of over 1300 end-user workstations distributed around campus. This campus wide network allows a user to access his personal files and customized environment configuration from any workstation. Athena accomplished this by making use of a distributed client/server model. In such a system, the user’s customized settings and personal files are located on servers that are scattered throughout the campus. Every time a user logs into a workstation on campus, the system is structured so that his files appear to be located on the local workstation. The workstation works with the remote servers to provide the user with the files and software that he needs. Clients don’t have to be running a specific operating system to gain access to some central services. The Athena workstations operate in the same manner. The workstation only contains a small amount of system software while everything else is delivered from a remote server. This method has several benefits. From the user’s standpoint, this method reduces the amount of the workstation resources that are used on functions and programs that are not useful to the particular user. Because the workstation only contains essential system data, the workstation can, in turn, apply its computational power to specific applications that the user requires. The Athena workstations are probably the most conspicuous piece of hardware. Much of the original equipment was donated by the Project Athena sponsors, DEC and IBM. Since then, the computing environment has been extended to machines developed by other vendors. Currently, most of the workstations are either Sun SPARC workstations or SGI ‘Indy’ workstations. Athena’s hardware also includes dozens of laser PostScript printers, four special electronic classrooms, workstations attached to projection displays for lecture demonstrations and a number of dialup servers. Recently, I/S has added New Media Centers, which are not related to Project Athena, but have increased the computing resources available to the MIT community. Available in these centers are Power Macs, graphics and slide scanners, color laser printers, CD-ROM recorders, digital video equipment and a large package of media-related software. The list of individual software packages available on Athena is quite long. In general, Athena provides the user with system software (UNIX or one of its derivatives), general application software (for electronic communication, text editing and page layout), mathematical and statistical analysis software, graphics and drawing packages, course-specific software, Internet applications and an extensive list of tools for programmers. “Athena has evolved from concentrating on custom-grown ‘courseware’ in the late 1980’s and early 1990’s to more concentration today on offering commercial applications that are integrated into the curriculum, such as Matlab, Maple, AutoCad, ProEngineer, FrameMaker, etc.” Schmidt said.